Issues of race have long divided Americans along racial and partisan lines, and these differences extend to views of whether white people in the U.S. benefit from advantages in society that black people do not have. 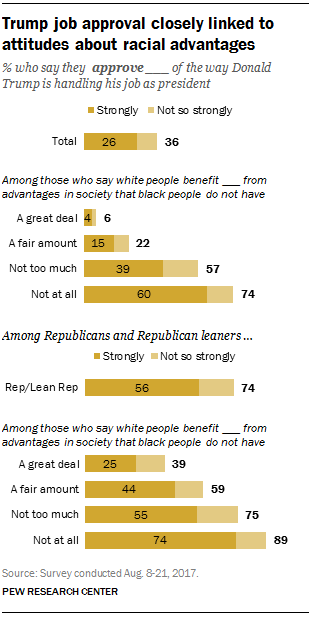 A majority of Americans (56%) say that white people either benefit “a great deal” (26%) or “a fair amount” (29%) from advantages that blacks do not have. About four-in-ten (43%) say white people benefit “not too much” (28%) or “not at all” (16%) from societal advantages, according to a Pew Research Center survey conducted Aug. 8 to 21 among 4,971 adults on the American Trends Panel. These attitudes are largely unchanged from a year ago, the last time the Center asked this question. Whites and blacks have distinctly different views. An overwhelming majority of blacks (92%) say whites benefit a great deal or a fair amount from advantages that blacks do not have, including 68% who say they benefit a great deal. By comparison, 46% of whites say whites benefit at least a fair amount from advantages in society that blacks don’t have, and just 16% of whites say whites benefit a great deal. Attitudes among Hispanics fall between those of whites and blacks, with about two-thirds of Hispanics (65%) saying white people benefit a great deal or a fair amount from societal privileges that black people do not have. The gap between Republicans and Democrats also is stark. Nearly eight-in-ten Democrats and Democratic-leaning independents (78%) say white people benefit a great deal or a fair amount from advantages unavailable to black people; just 21% say they do not benefit at all or do not benefit too much. The views of Republicans and Republican-leaning independents are nearly the opposite: 27% say whites benefit a great deal or a fair amount from societal advantages, compared with 72% who say they do not benefit at all or do not benefit too much. Although wide majorities of both black and white Democrats say whites enjoy at least a fair amount of advantages that blacks do not (95% and 73%, respectively), black Democrats are much more likely than white Democrats to say whites have a great deal of advantages (72% vs. 32%). Just as past surveys have found that feelings toward Donald Trump are associated with attitudes about racial and ethnic diversity, views of Trump’s job performance are closely connected to attitudes about whether whites have societal advantages that black people do not have. Those who do not think white people benefit from advantages in society say they approve of Trump’s performance at high levels, while those who think whites greatly benefit from advantages blacks don’t have are nearly unanimous in their disapproval of Trump. In the August survey, 36% of all adults approve of the way Trump is handling his job as president, including 26% who say they strongly approve. But among those who say white people do not benefit at all from advantages that black people do not have, 74% approve of Trump, with 60% approving strongly. Among those who say white people do not benefit too much from advantages that blacks do not have, a smaller majority (57%) approve of Trump’s job performance, including 39% who strongly approve. The link between these attitudes and views of Trump’s job performance is not solely the result of partisan differences over whether whites have societal advantages: Within both parties, these views are associated with presidential job approval. Among Republicans and Republican-leaning independents who say white people do not derive any benefits from their race, 89% approve of Trump’s job performance, with 74% strongly approving. Among Republicans who say whites benefit not too much compared to blacks in society, Trump’s overall job approval is lower, though still high (75%), and it falls to 59% among those saying whites benefit a fair amount. Among the 6% of Republicans and Republican leaners who say that white people have a great deal of advantage over black people, just 39% approve of Trump’s job performance. Among Democrats and Democratic-leaning independents who say whites benefit a great deal from societal advantages, nearly all (97%) disapprove of Trump’s performance, including 88% who disapprove strongly. By contrast, among Democrats who say whites do not benefit too much or do not benefit at all from societal advantages, 81% disapprove of Trump, with 64% saying they disapprove strongly. Note: Topline is available here (PDF), and methodology is here.